Rookhopper: As Grasshopper, but moves on Rook lines only. Bishophopper: As Grasshopper, but moves on Bishop lines only. Contra Grasshopper (CG): As G, but in reverse: the hurdle must be adjacent to the CG, which may land anywhere on the line beyond. 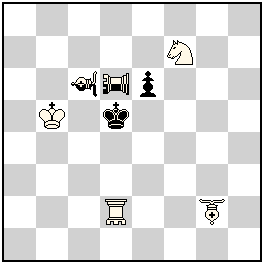 Contra Rookhopper: (0,1)Contra-Hopper – Plays as Contra Grasshopper but on Rook lines only. Contra Bishophopper: (1,1)Contra-Hopper – Plays as Contra Grasshopper but on Bishop lines only. Nice Anti batteries! What is Zabunov effect ? In the final mate positions, neutral contra rookhopper acts as front piece in a phase and as rear piece in the other phase. With this two roles, I think neutral contra rookhopper shows Zabunov effect. The same exchange of roles happens for the other 3 themathic pieces. ¿it requires always 3 different pieces A (rear and front) B (rear) and C (front) instead two pieces exchanging roles? ¿it requires only batterie play instead anti-batterie play? ¿it requires rear and front roles in the same phase or also applies throughout all phases?